You can find the shortcode under gallery preview. 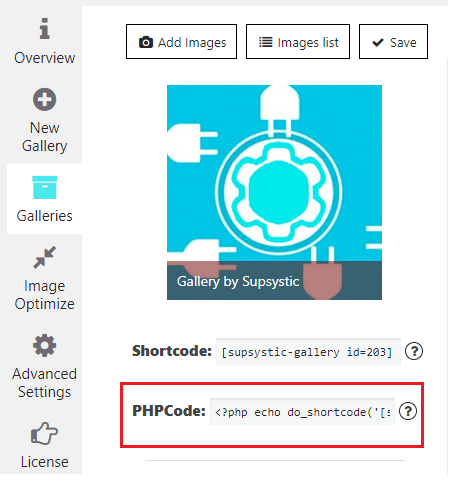 Copy and paste the shortcode into your post or page and WordPress plugin Gallery by Supsystic will automatically create the WordPress gallery on your page using the settings you choose above. Important! Shortcode must be inserted in a text editor page, and not in the visual. Besides you can use “add shortcode” button in WordPress editor. All you need is go to page or post into you want to insert gallery and click shortcode button in visual editor – “Add Gallery”. Then choose gallery which you need and click “Select” – shortcode will appear in the editor! To find php code – on the left navigation menu click “Galleries”. Here, for each gallery written its own php code. In general php code can be inserted at any place of the page code – to display exactly in this place, for example in the header or footer of the page. Besides it can be inserted in the code of template of the theme – to display on all pages. Also you can read more about How to open Gallery by link in Popup and show Gallery in the Widget. We found that maybe this info is not enough for you. If it’s true – find more about our Gallery plugin by Supsystic and its themes, layouts etc. 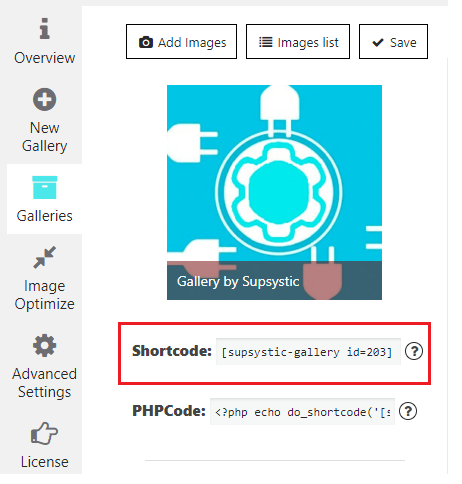 You can find more about our plugin and its themes – WordPress Gallery Plugin by Supsystic can be appropriate for all your requirements. Check out also the instructions for installation, questions from our users and our answers! Important! Read a lot of articles? Like to have more info? Need to ask something? Trip to our WordPress Documentation Page and ask everything on forums. Integration instruction is still needed? Some useful links? Don’t understand what are the Gallery types? Don’t forget to look through our FAQ page. Maybe we already have an answer to your question! Links to other similar themes you can find also on this page. The WordPress Photo Gallery plugin by Supsystic is an ultimate way to integrate your photo images, pictures and advertisements on the place. Gallery makes a site really unique and very interesting – image preview, lightboxes and big size pictures can provide the branding and name of your own business. Add Gallery to Site content and make the site design as you dream. Photo Gallery is perfect for using for creating various portfolio and grids with the best pictures, within various views. Photo Gallery plugin allows adding images, descriptions and titles for each portfolio gallery. Photo Gallery is rather useful whether using with various pages and posts, as well as within custom location. What about responsiveness? Install WordPress Photo Gallery in the site content and be sure that it is a fully responsive plugin, which adapts to your screen size and make it convenient to use, Besides portfolio gallery, the whole Gallery also responsive. Photo gallery plugin is easy to insert into any part of your template and use our plugin inserting the short or php code. How to use tags for image categories?